(aka IABP) Used for circulatory support, the balloon inflates in diastole and deflates in systole. 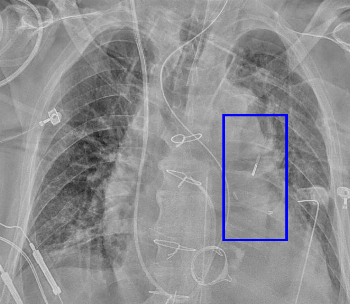 Generally, only the radiopaque tip of the catheter is visualized, although if it is caught while inflated, you may see the balloon itself (over the descending aorta). The balloon is quite long and extends for the majority of the descending aorta's length. The ideal position of the balloon is just distal to the subclavian artery and just proximal to the celiac artery, so that it does not obstruct either. General rules of thumb are either just below the aortic knob or 2 cm above the carina (see PMID 17717232). Note that some IABPs are now being placed via an axillary approach. For these, the marker is usually left at the subclavian artery origin on purpose.